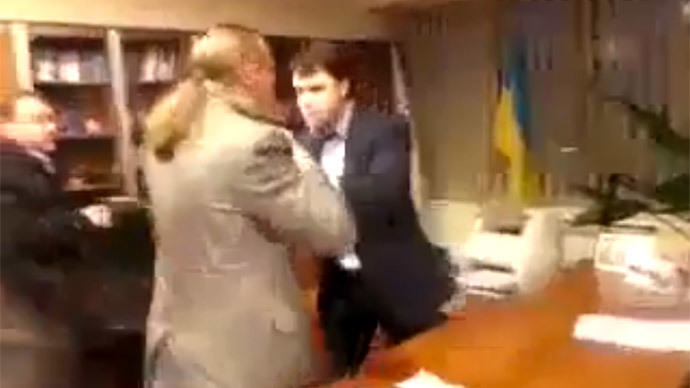 A Ukrainian parliamentarian from the nationalist Svoboda party has removed RT’s YouTube video of another Svoboda deputy physically abusing the head of a national television network in Kiev – saying it violates copyright. 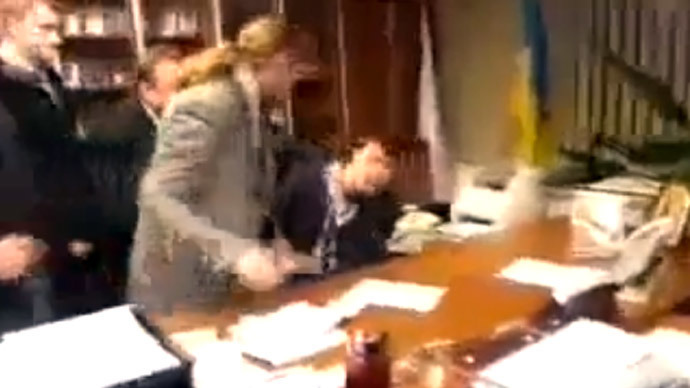 Recorded on Wednesday, the footage shows ponytailed Igor Miroshnichenko and a coterie of other nationalist MPs bursting into the office of Aleksandr Panteleymonov, the acting head of the National Television Company of Ukraine, the country’s state broadcaster. Miroshnichenko starts off by accusing the beleaguered Panteleymonov, who was appointed a month ago, of putting out pro-Russian coverage of recent events in Crimea. 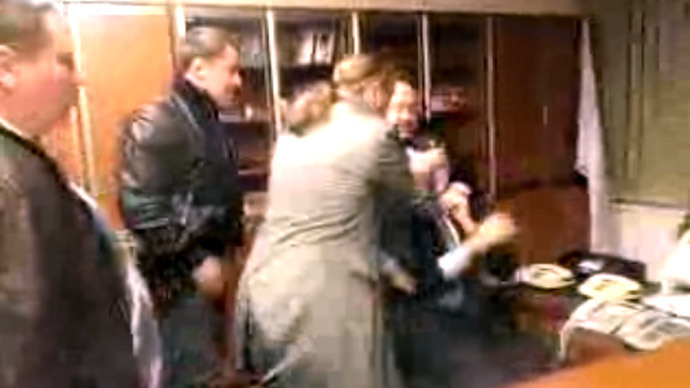 He then violently plunges him into his chair, and forces Panteleymonov to write an impromptu resignation. The video, shot and uploaded by MP Aleksandr Aronec, immediately went viral, with hundreds of thousands of views on various websites. RT’s version, with English subtitles, accumulated more than 30 thousand views. But now Aronec has struck it down on legal grounds. “We know RT’s massive popularity on YouTube will always ensure we’re targeted in these situations. We will contest the rights call under fair use and believe the subtitling, context and news value of the video qualify it as important factual content. We’re proud we broadcasted another critical element of this, unfortunately very brutal, news story,” said Ivor Crotty, RT’s Head of Social Media. It appears as if RT, which broadcasts to an international audience, was singled out - the video continues to be available on Aronec’s own Ustream channel - in a belated attempt at damage limitation. “It’s disappointing and not unexpected. Video content from Ukraine has even dwarfed output from Syria and for an actual participant in the violent video to issue a ‘rights’ call is frustrating for publishers. That the video of the Svoboda MP’s brutality sparked anger and protests in Kiev may explain the attempt to censor it,” said Crotty. Miroshnichenko, Aronec and others involved in the debacle were censured in the Rada, where fellow deputies accused them of spoiling the image of Ukraine abroad. They also came under fire from more moderate politicians, including interim Prime Minister Arseniy Yatsenuk, and Vitaly Klitschko, who said that those involved must surrender their seats. 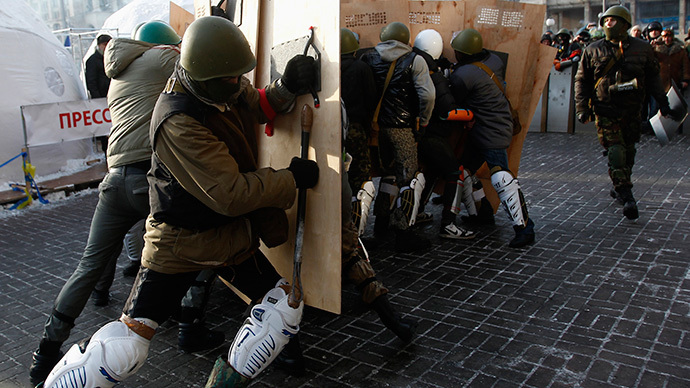 The General Prosecutor’s office has opened an investigation into the incident, after public pickets in Kiev.